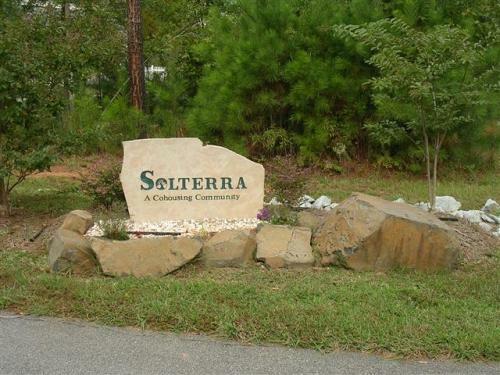 Solterra is a cohousing community nestled in a semirural area close to Duke University and the University of North Carolina, Chapel Hill. We enjoy Durham city services and excellent nearby public and private schools. Our 20 acres are open and wooded, and adjoin 100 wooded acres recently made into a park, so our community is immune from adjacent development. Homes are single-family and privately owned. Each home is car-accessible. Members share common lands, paths, play spaces, a common house, roads, a large dog park, and a large common garden. Our members come from every part of the country and range in age from small children to senior citizens. Our interests are broad, and our consensus form of management includes committees to oversee all phases of development and Solterra social life. We share meals most Sunday and Tuesday evenings. Eating choices vary from meat-eating to vegan, and our common meals reflect this. There are 37 resident families currently.